In an evening notable for toasts and remembrance, the Madison Scouts held the championship 30th anniversary dinner on Saturday, Oct. 1. This black tie affair paid tribute to the members and staff of one of Drum Corps International's most memorable champions, the 1975 Madison Scouts. 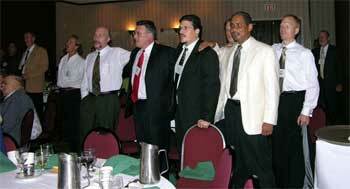 Strains of "The Way We Were" echoed through the banquet halls of the Marriott Madison–West that night, recalling the first DCI Title earned by one of America's favorite drum corps. Amid cocktails and dinner, old friendships were renewed, and former members, staff and friends shared tales of an amazing season, decades ago. Members of the 1975 Madison Scouts gather at the Oct. 1 reunion. Master of Ceremonies Jim Elvord captured the mood of the event, saluting event chairman Joe Murray, and introducing honored guests Bill Howard (former Scouts director) and Sal Salas (current executive director). Elvord's words brought forth recollections of a magical season in which the corps connected emotionally with audiences throughout the country, forever establishing itself as a leading "Midwestern powerhouse." Many of the 1975 staff were in attendance, including Bruce Lages, Frank Godfrey, Paul Litteau, Bob Wenderski, Phineas Horton, Jeff Knupp, as well as Salas and Elvord himself. 1975 board president Jeanne Beckman spoke about the corps' dedication and accomplishment. Evoking remembrances from those men who were part of this amazing corps, the anniversary dinner featured many speakers, including Chris Tomsa, Ray Weiner, Doug Tholo, David Beckman, Al Temby, Chris Theo, Todd Waech, Dan Veerhusen, and Chris Forbes ( Metzger). All were memorable for their warmth, insight and humor. Completing the event's program was the big-screen presentation of the 1975 championship performance. Amid thunderous applause from those fans of yesterday, and those in the hall, the video recaptured that night 30 years ago when the brash "men of Madison" swept to a resounding victory. Breaking the West Coast run on DCI titles, and stealing the hearts of drum corps fans young and old, the performance was the perfect combination of passion and precision. Everyone from that singular season then assembled to sing the fight song, "We'll March On Victorious." And in a gesture that connects yesterday to today, these alumni offered the Madison theme song, "You'll Never Walk Alone." Echoes of history held sway until the early hours of the morning, with alumni and friends sharing memories of this great season and this great champion, the Madison Scouts.